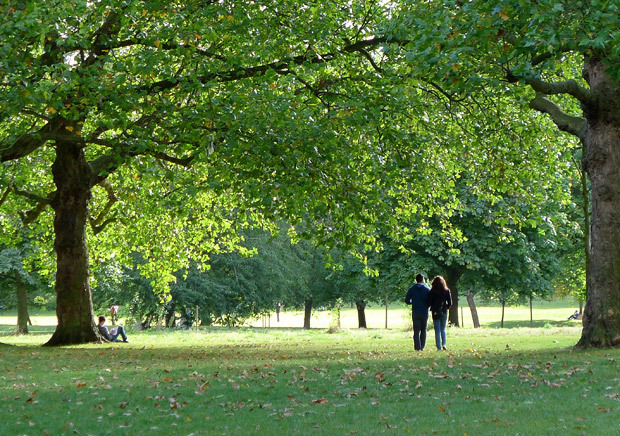 Late Saturday afternoon, I went for a hangover-clearing autumnal stroll through central London, taking in two parks and stopping off for some art. 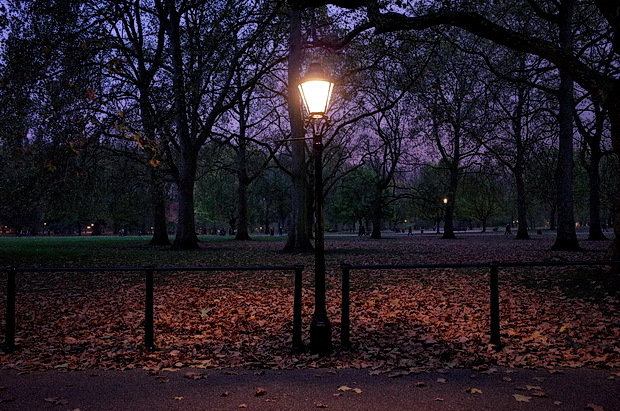 I started off at Green Park tube station, and rambled through the near-deserted, gas-lit Green Park before walking through St James’s Park in the dark. 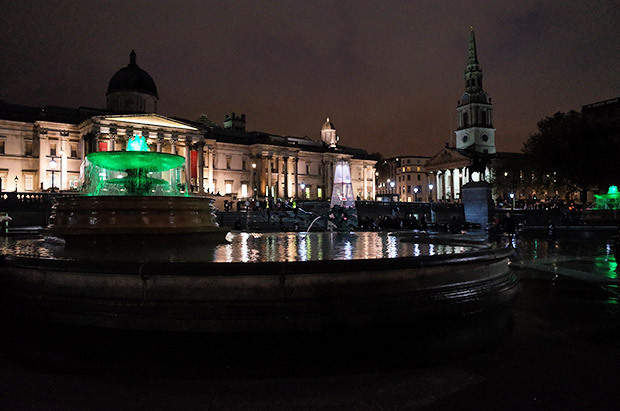 I then attempted to dodge some major rain showers before cutting across Trafalgar Square – taking in an hour at the wonderful National Gallery – before heading north in the driving rain to arrive at at Warren Street tube. You can see the full 2.5 mile route mapped here, if so inclined. 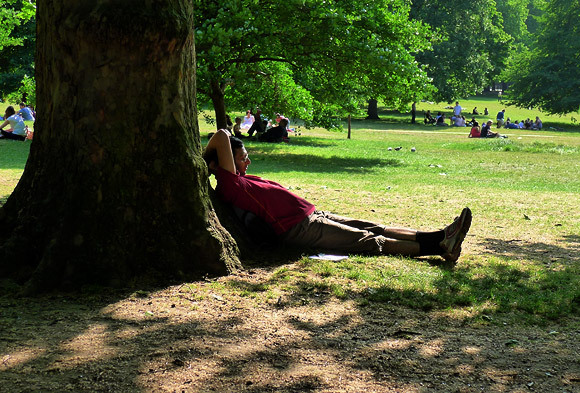 Leaving Green Park station and walking into the park. Looking back you can see this magnificent building on Piccadilly. 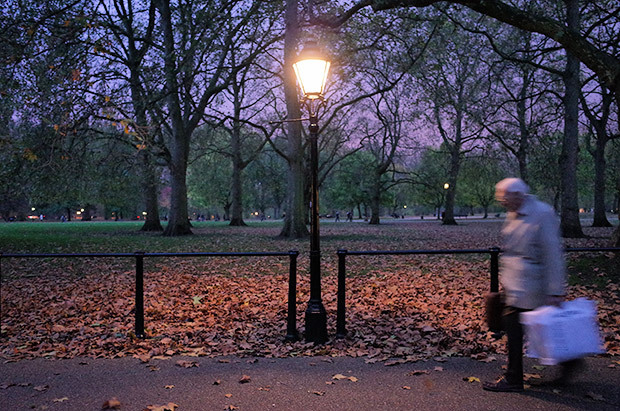 An elderly shopper is briefly illuminated by one of the the Victorian gas-lamps that cover the park. 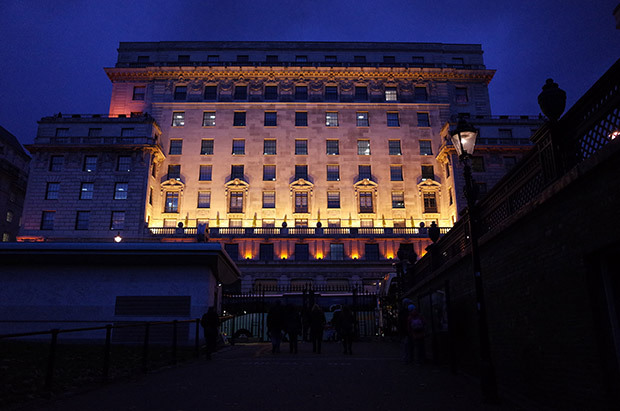 Grand buildings bordering Green Park. 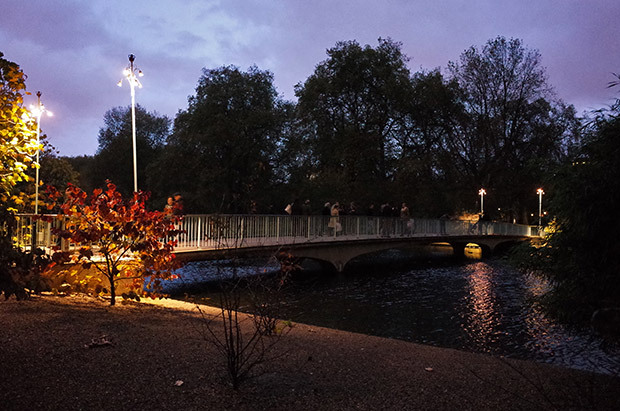 Bridge across St James’s Park Lake. 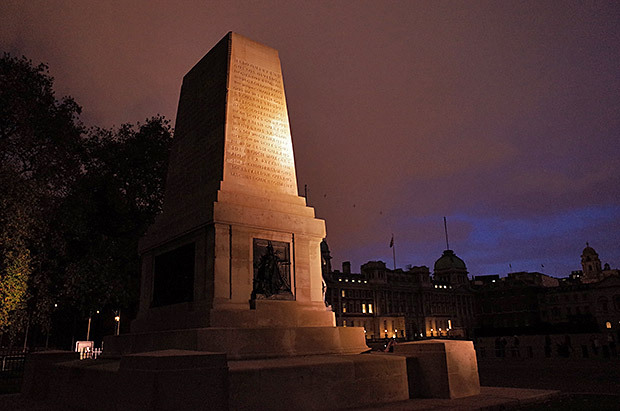 Guards Division Memorial on Horse Guards Road. 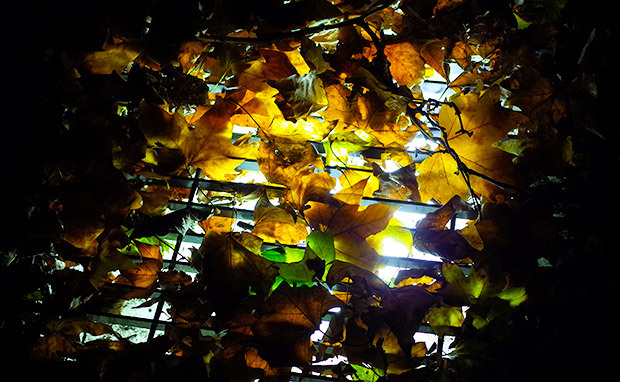 Autumn leaves covering up the underfloor lighting. 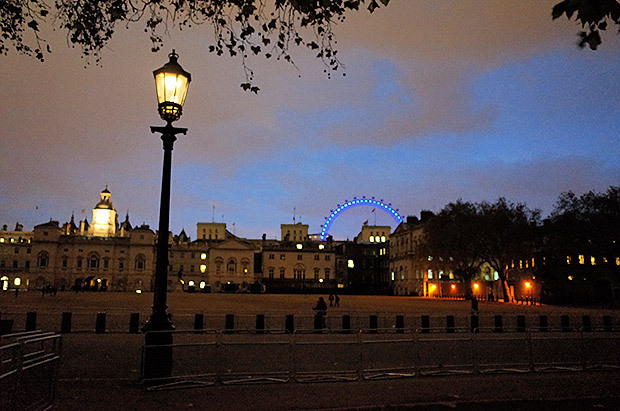 Looking across Horse Guards Parade as night falls. 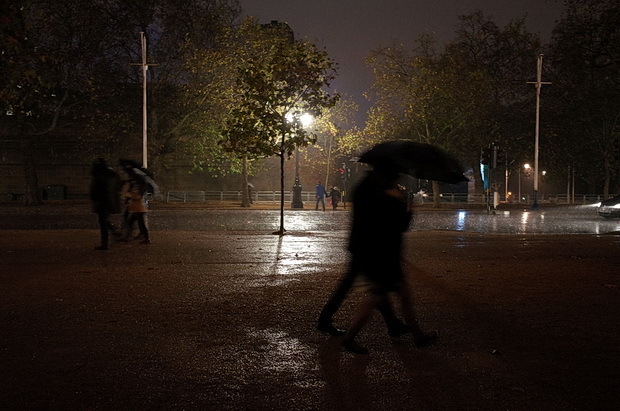 The heavens opened, so I ran for cover under the arches of the Mall Galleries on The Mall. 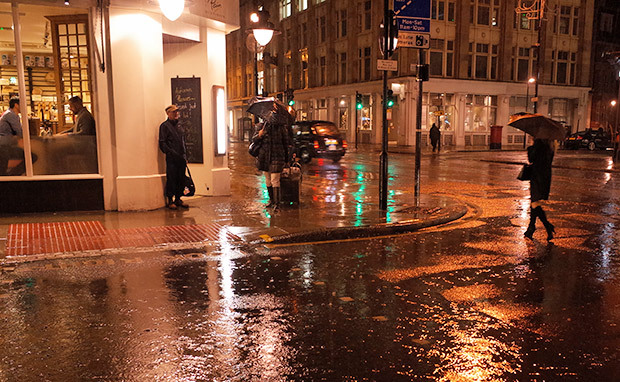 With the suitably melancholic Blue Nile ‘Hats’ album playing in my earphones, I snapped a few shots of folks scurrying along the rain-soaked pavements. 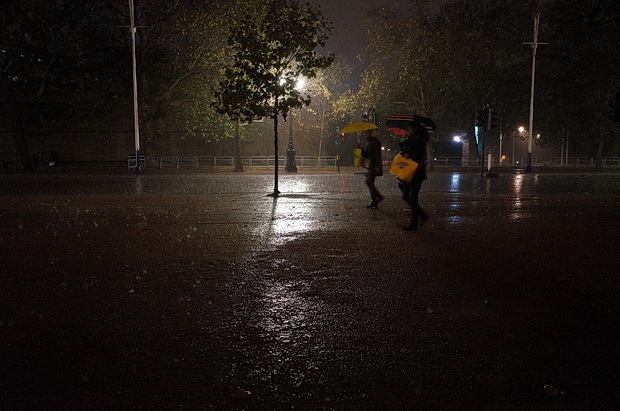 The rain finally stopped, and I made my way to Trafalgar Square. 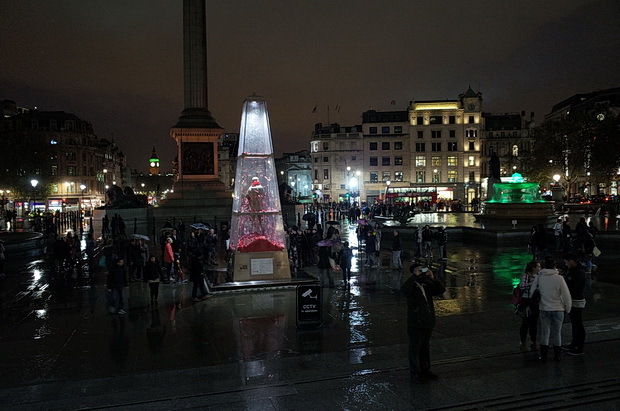 This interesting sculpture in Trafalgar Square was designed by artist Mark Humphrey. 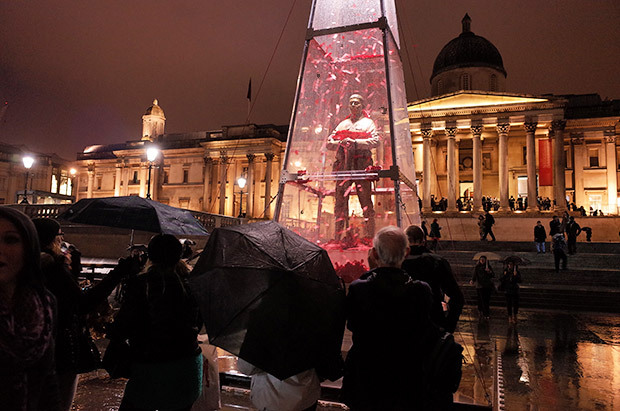 It contains a brass figure -based on the Unknown Soldier, standing in a Perspex obelisk with poppies that sporadically blow in the air around him, giving the effect of a giant snow-globe that’s been shaken. I have to say that I found it a bit gimmicky for such a serious subject, but you can read more here. 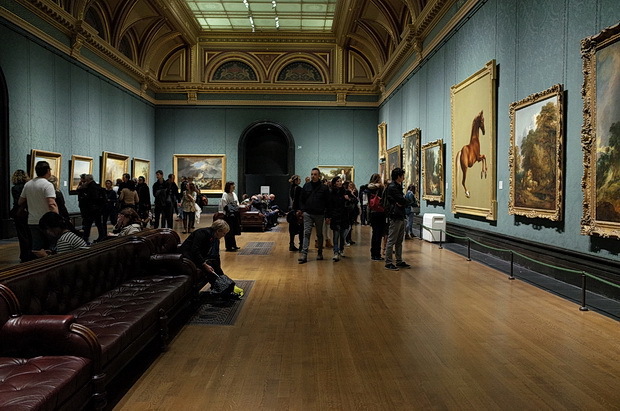 I love visiting the National Gallery, especially the impressionist and post impressionist galleries. 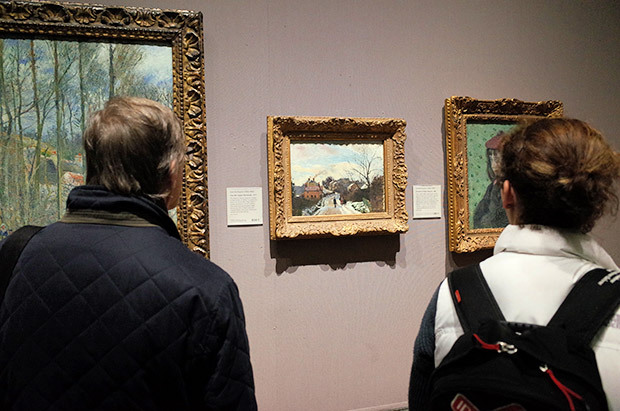 I can spend hours just getting lost in the worlds of the artists. 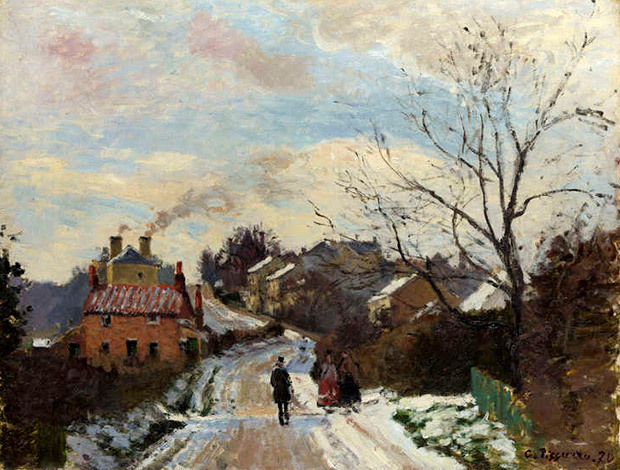 The wintry Pissaro painting in the middle of the frame is one of my favourite paintings (more below). 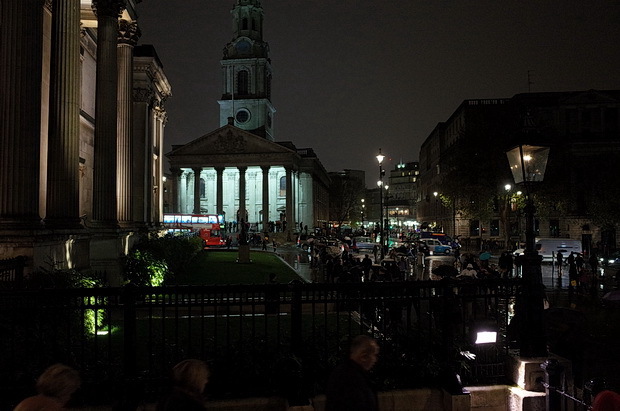 The imposing 1724 edifice of St Martin-in-the-Fields church as seen from the steps of the National Gallery. 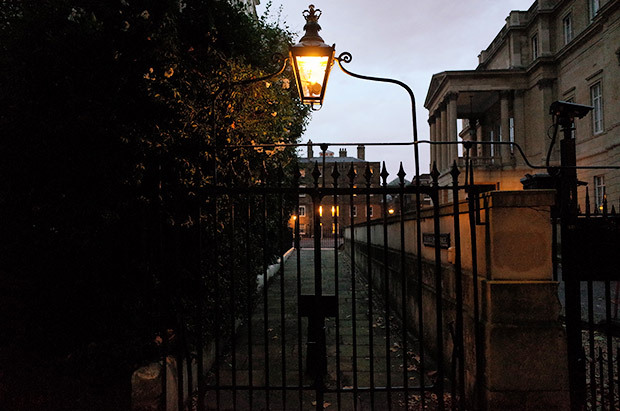 Note the gas lamp to the right of the photo (as you’ve probably guessed by now – I’m rather keen on gas lamps!). 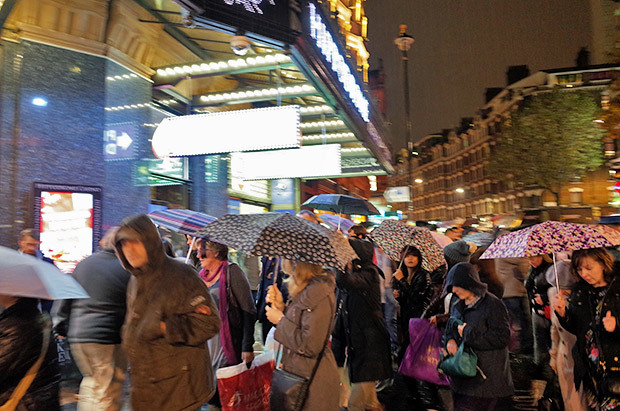 Pushing through the brolly-clutching crowds outside the London Hippodrome. 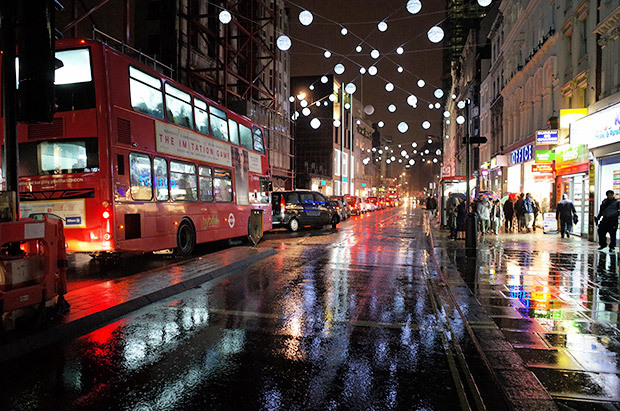 The Christmas lights are already up on Oxford Street. Read my thoughts on this (and find out about changing London Christmas traditions) in this article from last year: Oxford Street Christmas lights are turned on – in ruddy November, FFS. 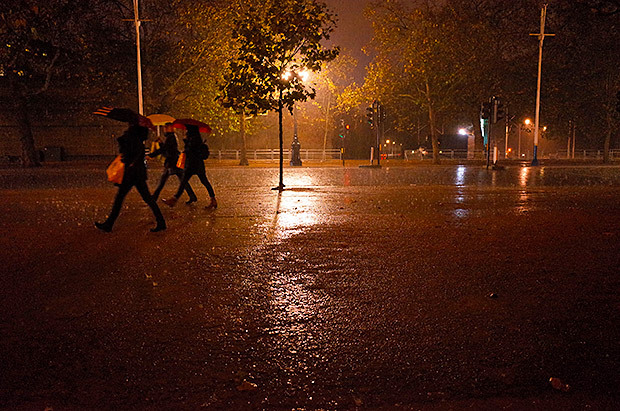 A rainswept Tottenham Court Road. 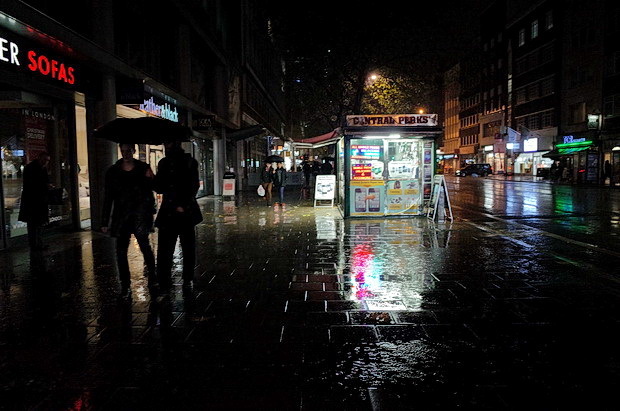 Kiosk lights reflect off the rain-soaked pavements on Tottenham Court Road. By this time, the rain had been so persistent that I was reduced to wearing a cardboard box on top of my head for cover! 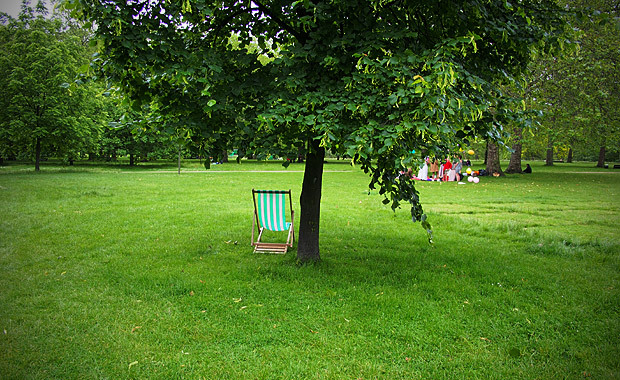 All photos taken with the lovely Ricoh GR compact camera.